1. The market is in an uptrend. This could be identified by the fact that the price is above the 50-period Moving Average; MACD or Momentum are above 0; or ADX is above 25 an +DI is above -DI. 2. After a correction of the up move the last three bars have lower highs. The last of these three bars is marked as Signal bar. 3. Long position is initiated when the price breaks 2-3 pips above the high of the Signal bar. 4. After the position is open an initial stop loss order is placed 2-3 pips below the low of the signal bar. 5. A limit order is placed according our Money management rules. We can close the position when one of our indicators shows that the uptrend is over. 1. The market is in an downtrend. This could be identified by the fact that the price is below the 50-period Moving Average; MACD or Momentum are below 0; or ADX is above 25 an -DI is above +DI. 2. After a correction of the down move the last three bars have higher lows. The last of these three bars is marked as Signal bar. 3. Short position is initiated when the price breaks 2-3 pips below the low of the Signal bar. 4. 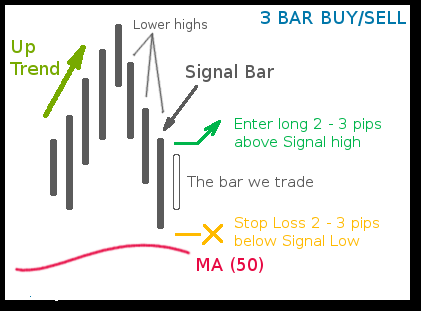 After the position is open an initial stop loss order is placed 2-3 pips above the high of the signal bar. 5. A limit order is placed according our Money management rules. We can close the position when one of our indicators shows that the downtrend is over.